If you're epileptic, click here right now. Otherwise, keep on reading. This is a "sundry flight of whimsy" week while I work on more serious stuff for later posts. I've been a major contributor (39 so far by my count) to the r/FullMovieGifs subreddit; my latest contribution is J.J. Abrams's Star Trek (2009), with only the scenes with lens flares. Which is pretty much most of them. (I uploaded the whole movie as well.) Click on the image if you want to see it bigger. I wonder our science fiction is as bad at projecting design into the future. What kind of a ship are they running? 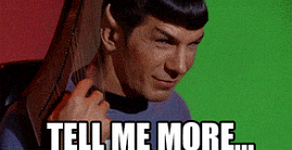 To those who say Spock never shows emotion. Sulu is Japanese, and yet the Japanese language doesn't have the letter "L". A Han and Leia moment.